Amongst the brave Sikh Freedom Fighters hailing from the Malwa region of Punjab, the name of Bhai Darshan Singh Babbar is held in high regard. Bhai Darshan Singh was born on June 17, 1951 in village Aklia Khurd, district Bathinda into the household of Sardar Hazura Singh and Mata Daleep Kaur. Bhai Darshan Singh was a religious individual and eager to serve the Sikh nation and became connected with the Sikh Sangarsh when they came in contact with Sant Jarnail Singh Khalsa Bhindranwale in 1980 when Sant Ji visited a Gurudwara in Gangsar, from this meeting Bhai Darshan Singh developed contact with Sant Jarnail Singh and Singh’s of Damdami Taksal. Bhai Darshan Singh was thereafter given the responsibility of doing sewa in Talwandi Sabo area. It was here that Bhai Darshan Singh learned of the Indian Army attack on Sri Darbar Sahib in June 1984. Unable to reach Sri Darbar Sahib due to curfew and Army checkpoints, Bhai Darshan Singh decided to go underground and join the Sikh resistance movement. In February 1988, Bhai Darshan Singh was arrested and after enduring a lengthy period of inhumane torture was sent to jail. After spending 9 months in jail Bhai Darshan Singh received bail and was released to return home where he attempted to return to a normal life and look after his elderly parents. However the local Police made it a priority to harass and abuse the family on a regular basis. Eventually in September 1990, Bhai Darshan Singh left his family home and once again went underground. At this point Bhai Darshan Singh was actively involved in Sewa with Babbar Khalsa Jathebandi and began punishing the anti-Sikh elements in the area. Bhai Darshan Singh fought valiantly and won many battles against the Indian security forces and as such commanded respect from Freedom Fighters in the area and was deeply feared by the security forces. During encounters with the Police, officers were known to hide behind one another to prevent themselves from participating, such was their fear of Bhai Darshan Singh. In some instances, the fearless Bhai Darshan Singh would dress as a Police Inspector to pass Police checkpoints in the area and was so convincing that many officers would stop to salute Bhai Darshan Singh as he passed through. Bhai Darshan Singh rose through the ranks of the Jathebandi and following the Shaheedi of Bhai Balwinder Singh ‘Ganga’, was appointed the Chief of Malwa zone for the Babbar Khalsa. 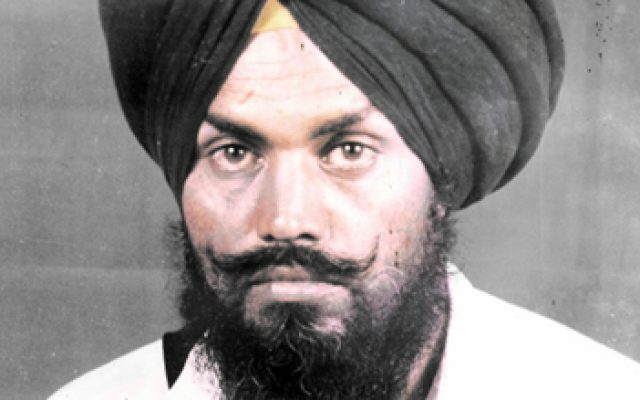 Bhai Darshan Singh was now wanted in connection with dozens of cases across Punjab, Delhi and Haryana which included the assassinations of former MP’s Shaminder Singh (Akali Dal Badal), Hakam Singh Meeyan (Congress) as well as killings of Chairman of Commission for Agricultural Costs and Prices (Delhi) Dr Tiyagi, President of BJP (Mansa), a Nirinkari from village Sukhana, Sarpanch of village Blahar Vinjhu and Tehsildar of Mansa. Cases of assassinations of biased Hindu media journalists, firing upon BSF, CRPF and Punjab Police were also registered against Bhai Darshan Singh and the Babbars of Malwa zone. Sadly, much like throughout Sikh history, it was the treachery and betrayal by those considered as their own that led to the fateful end of the Singhs. Many of these Singhs were arrested due to infiltration of the group by a Police informant and subsequently attained Shaheedi in fake police encounters. Bhai Darshan Singh along with Bhai Jugraj Singh ‘Rasheen’ Babbar, Bhai Pargat Singh ‘Fauji’ Babbar, Bhai Gurmeet Singh ‘Laadi’ Babbar, Bhai Davinder Singh ‘Kalsian’ Babbar were captured alive during Police raids and later killed in fake Police encounters. However, the story fed to the media during a press conference held by the Police, was that 6 Singh’s had been killed during an intense and lengthy encounter on March 6, 1993, near the village of Balluana, Bathinda.